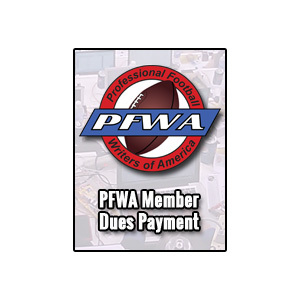 PFWA Members: You can pay for your PFWA dues here. A 1-year payment ($50) will give you a subscription that will run for one calendar year from the time your payment is accepted. A one-year dues subscription to the PFWA allows members to access the Members Area of the PFWA website (ProFootballWriters.org) and vote for annual On-Field and Off-Field Awards as well as receive perks of membership all year. A one-year dues subscription to the PFWA allows members to access the Members Area of the PFWA website (ProFootballWriters.org) and vote for annual On-Field and Off-Field Awards, as well as other perks from the PFWA (NFL Game Pass subscription, etc.). You will receive a reminder notice approximately two weeks prior to the end of your subscription period.